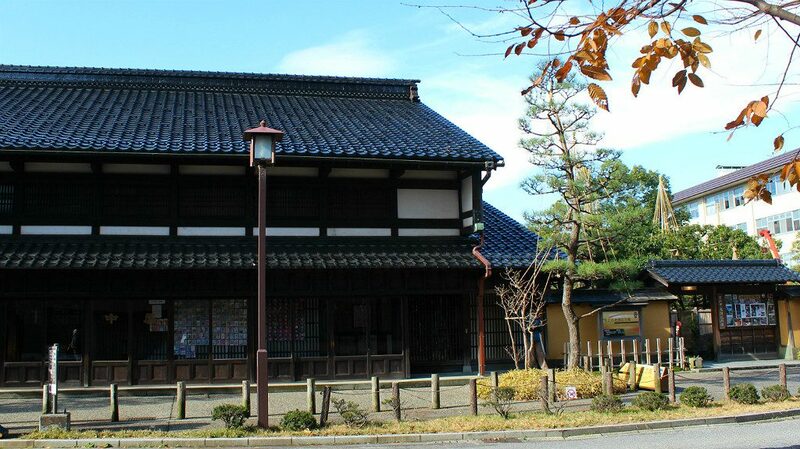 Literally meaning “the long samurai residence neighborhood,” Nagamachi Buke-yashiki was home to high and mid-ranking samurai soldiers of Edo-era Kanazawa and is currently home to three of Kanazawa’s five samurai museums. 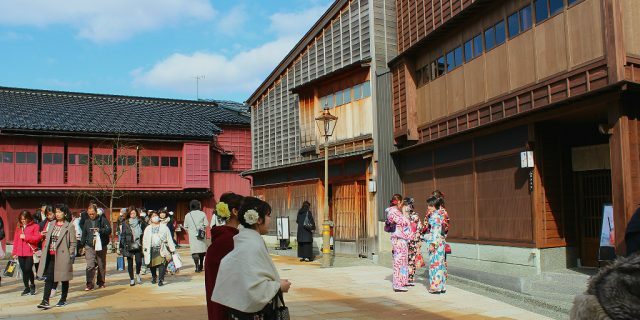 It’s also an easy walk from both the Tatemachi shopping promenade and to the western geisha district. The tawny stone and mud walls that line the streets turn the neighborhood into a fortress. Each gate to the residences behind these walls is carefully constructed to close quickly and securely in the event of an attack. 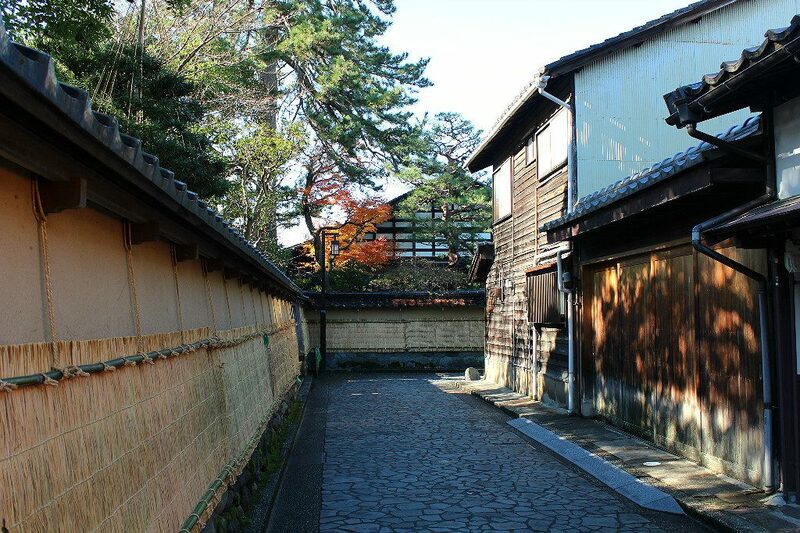 The walls are famously layered with sheets of rice straw in winter, called komogake (薦掛け), to protect the outer coating from harsher snow storms. Their appearance in early December indicates that winter is nearly here. The main road changes from asphalt to cobblestone in the longest stretch. 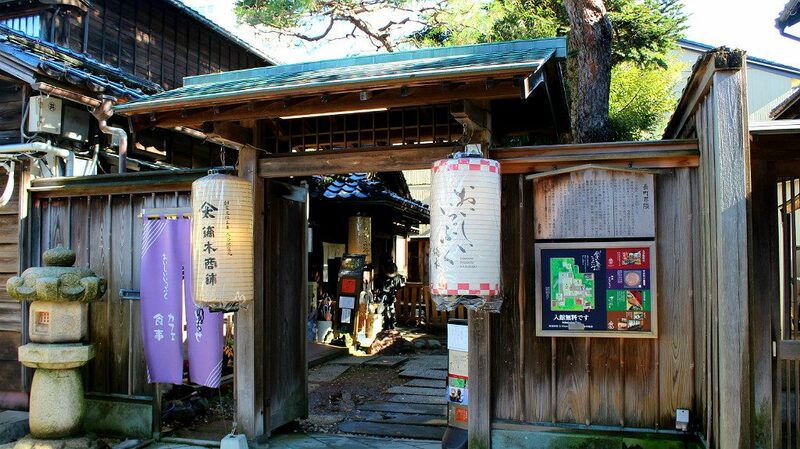 A kutani-yaki ceramics shop and restaurant marks the jog in the road with a sister shop just a few steps away. The main shop features both artist- and factory-made ceramics in the area’s traditional pottery style. 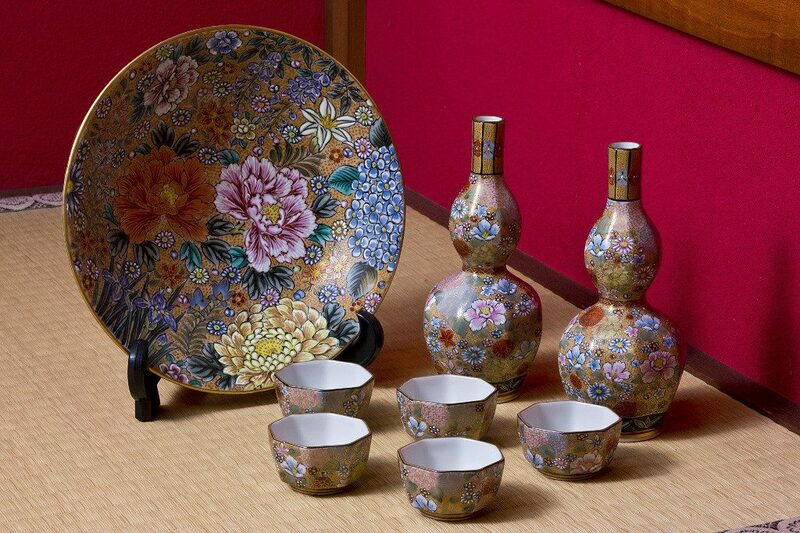 Check out the various ceramic styles that evolved throughout the craft’s history, enjoy a snack and tea on kutani-ware while overlooking the shop’s private garden, and take home a souvenir to suit any budget. Both private and public gardens pepper the neighborhood. If the weather is good, some residents open up their private garden areas during daylight hours. 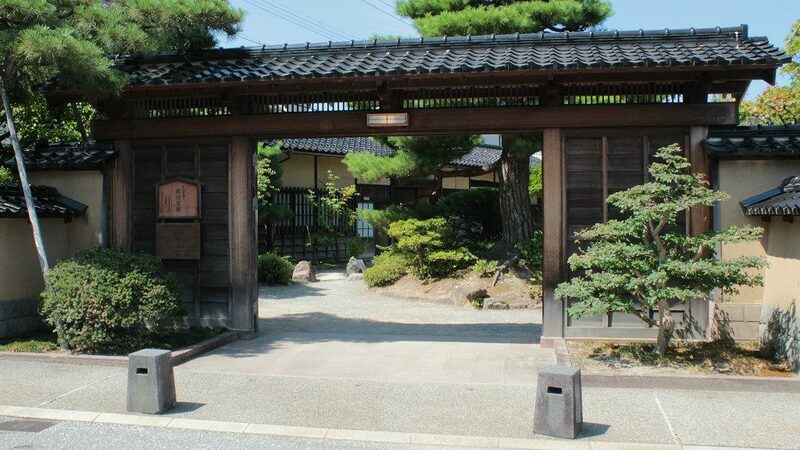 Stroll through an old samurai’s backyard and take a peak inside windows at the finely preserved homes. As the cobblestone street comes to an end, it meets with another moat-lined road running parallel to Seseragi Street. 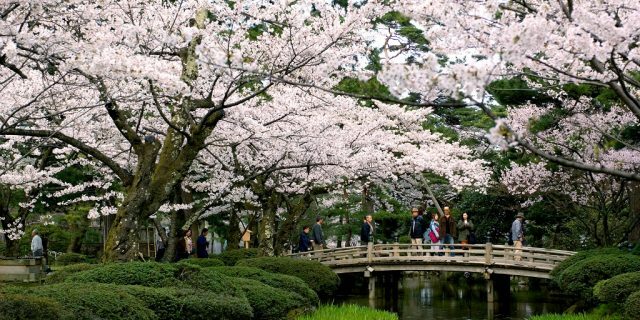 These moats both protected the samurai district and supplied water to Kanazawa Castle from the nearby Sai River. Today, they serve as reservoirs and drains, maintaining the river’s water level to prevent flooding during Hokuriku’s rainier seasons. 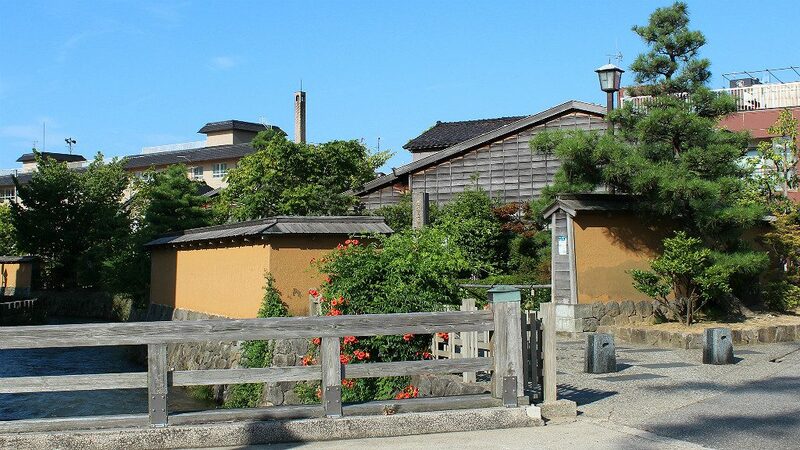 The one in the heart of Nagamachi is the Ohno-sho Waterway, the oldest in the castle town, constructed around 1590. 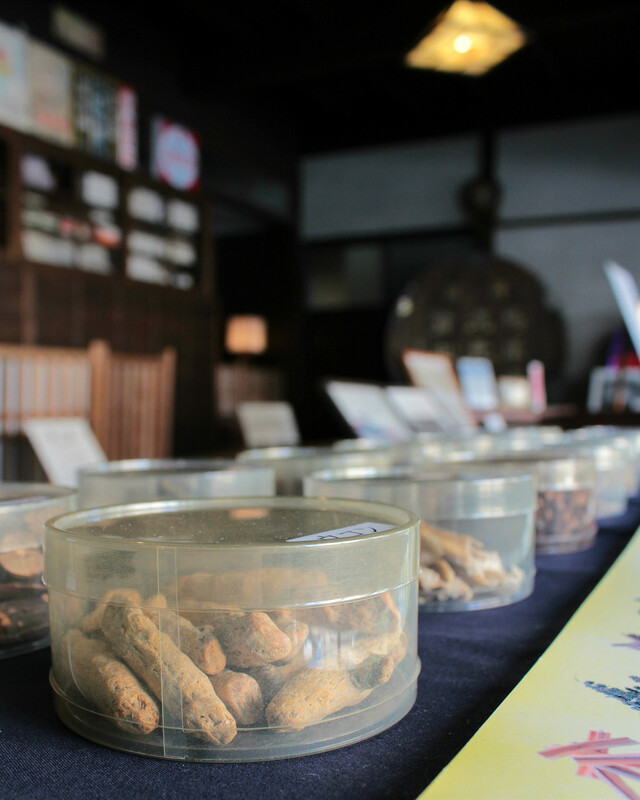 A minute’s walk south is a preserved 450-year-old Chinese medicine pharmacy, one of the oldest shops in the neighborhood and a museum, the Shinse Memorial Hall. Inside, the museum is a hodgepodge of history and crafts related to the neighborhood. The traditional storefront displays the day-to-day business and where each member of the staff sat per their rank. Traditional medicines occupy bottles to one side. 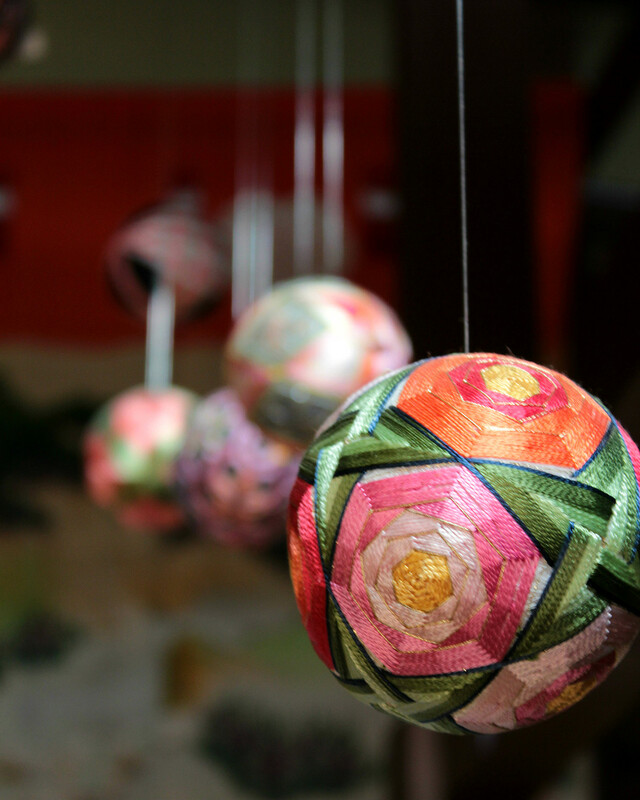 Further in, temari, traditionally sewn handballs for children or young brides-to-be, fill several rooms. 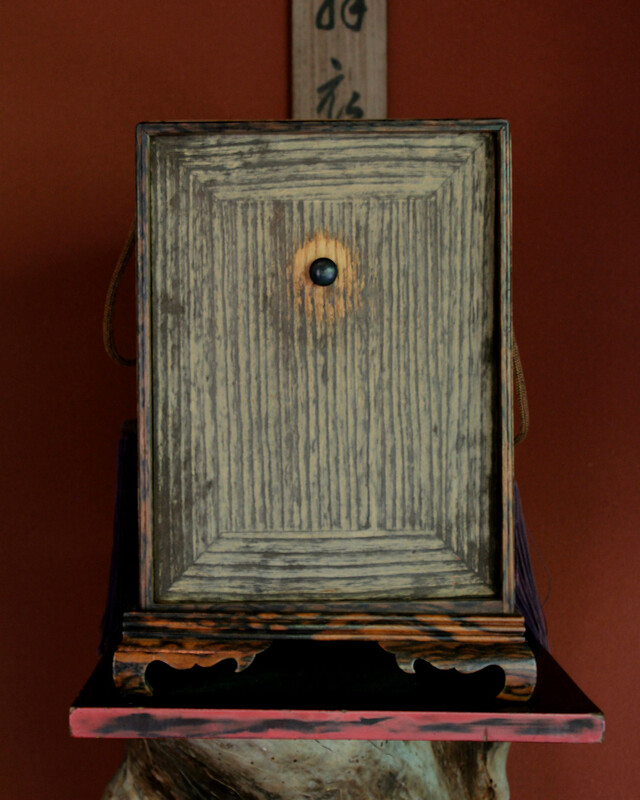 Upstairs, antiques from once-neighboring stores and homes are on display alongside traditional Kaga region crafts. 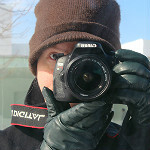 No photography inside this one! 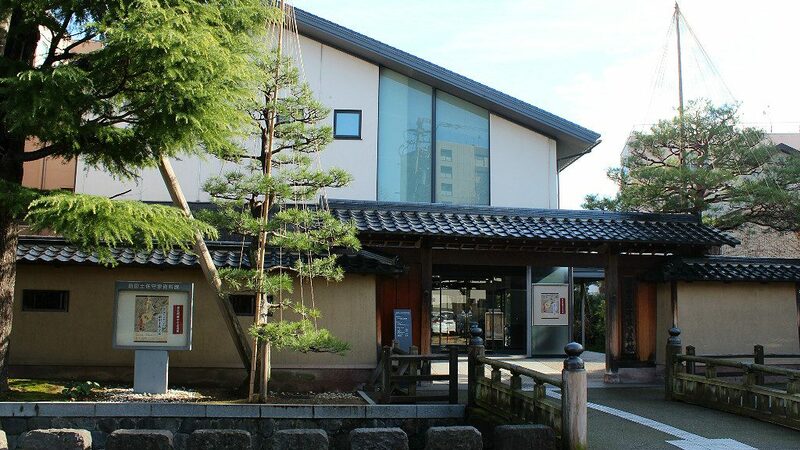 Just a few steps from the pharmacy is the Maeda Tosanokami-ke Shiryokan Museum, dedicated to the samurai family of the ruling lord’s second son. Spanning two floors, most of the museum’s contents are preserved documents and relics between the Maedas and the ruling Shogunate. 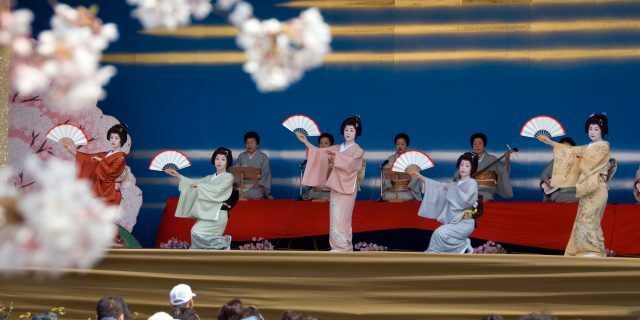 History buffs can find letters written by Oda Nobunaga and Toyotomi Hideyoshi. 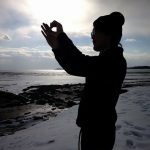 However, English is limited. 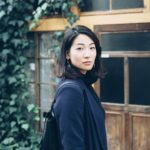 Despite the austere nature of the museum’s contents, the real appeal for most visitors will be the two sets of samurai armor featured inside, one on each floor. In particular, the set on the first floor is the museum’s pride and joy. Nearly the entire set is covered in black lacquer, and is pronounced by a pair of silver rabbit ears, meant to evoke the wearer’s playfulness and cunning in battle. 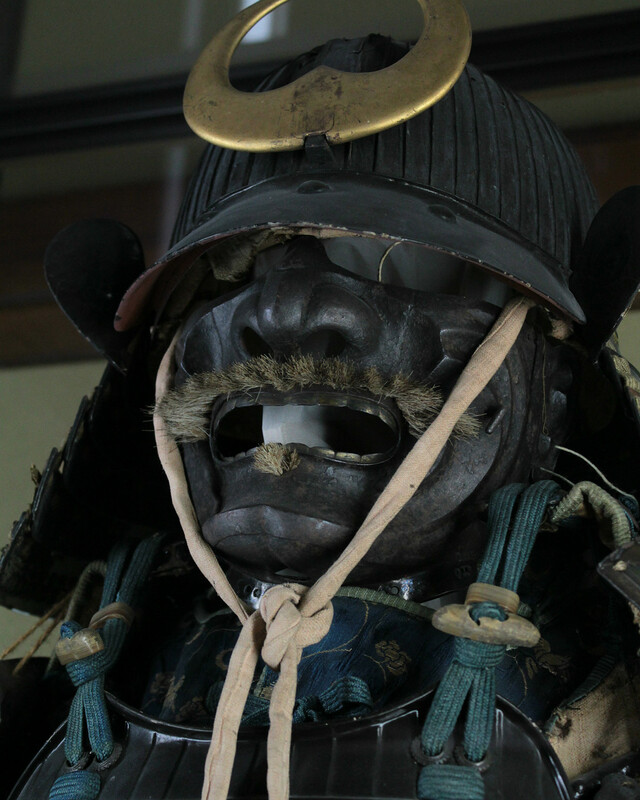 The first thing to greet visitors who enter Kanazawa’s famous Nomura Samurai Family Residence is the clan’s impressive mustachioed suit of samurai armor. Most of the museum is a celebration of the house itself, originally belonging to a merchant family whose wealth is evident throughout the premises. The private garden inside is one of the top rated throughout Japan, earning it two Michelin stars. The cultivated plants, carefully chosen stones, and playful koi fish can be enjoyed from several locations in the house. It’s even viewable from the upstairs, where matcha green tea service is available. Don’t miss visiting the back area of the building where it connects to the old storehouse. 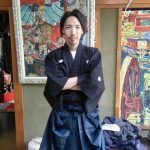 Here is Nomura’s gallery proper, featuring his katana blades among other items, including a handwritten note from a feudal lord, thanking Nomura for the gift of an enemy’s head. 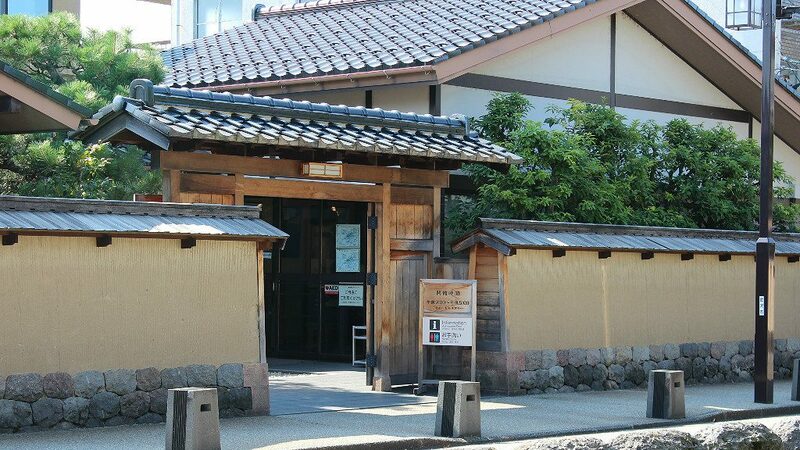 A little further down the road is the Kyukeikan Resthouse, a restored machiya-style house turned information hub and resting spot. 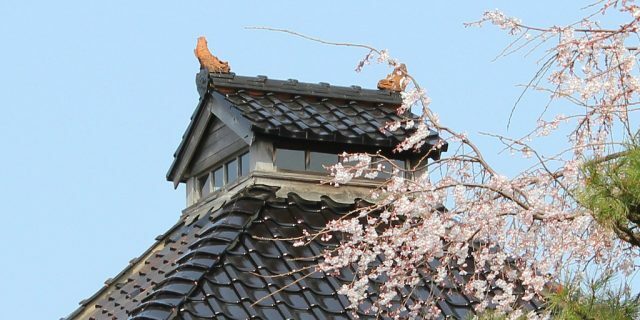 Volunteers at the resthouse can answer questions about the neighborhood and about Kanazawa in general. In addition to toilets and air conditioning, this resthouse also includes displays of the area’s crafts specialties. 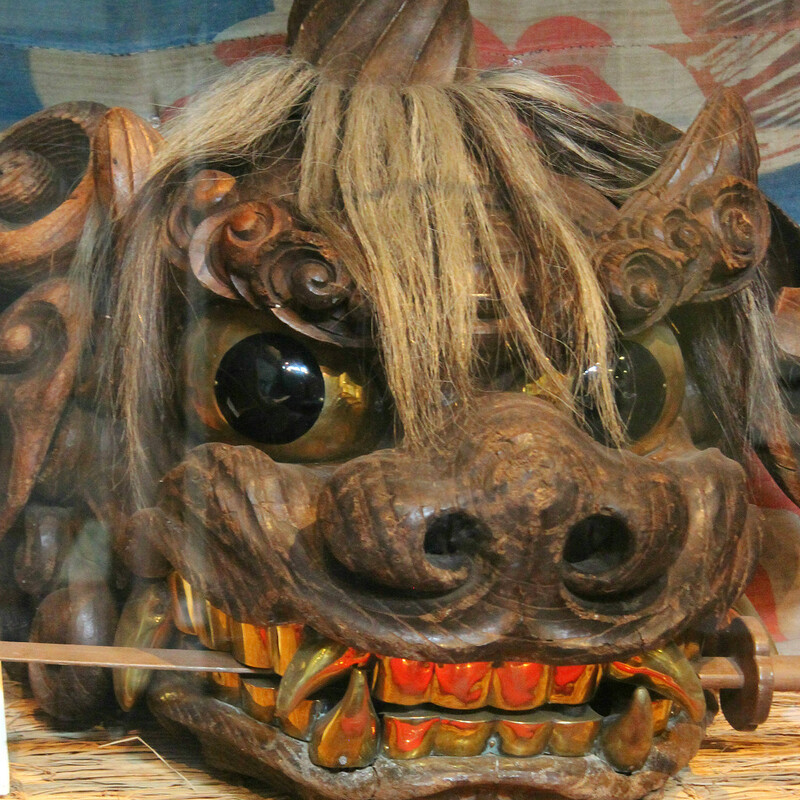 When we visited, the eyes of this festival Lion’s Head seemed to follow us. Beyond that is the remains of the Takada family, a moderately wealthy samurai family home whose horse stables and garden area still stand. 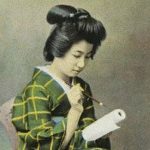 For those interested in kimono fabric and creation, head west along the road next to the Takada Family Remains. About two blocks down on the right is the Nagamachi Yuzen-kan, an old warehouse that houses a gallery on the second floor. The elaborate, multi-step dyeing processes is illustrated on the third floor and a workshop is occasionally open. 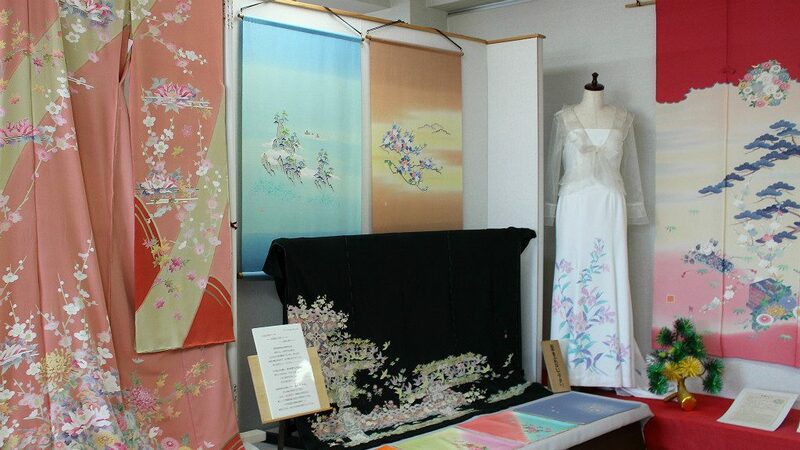 Kimono rentals are also available here. The entrance is up the stairs on the second floor of a white-tiled building, slightly away from the street. From the Takada Family Remains, continue down the road about two blocks. 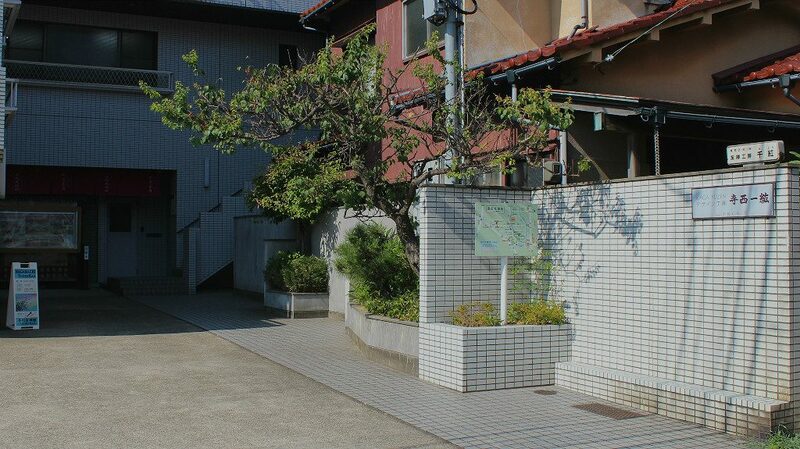 On the right is the open house Ashigaru Shiryokan Museum. 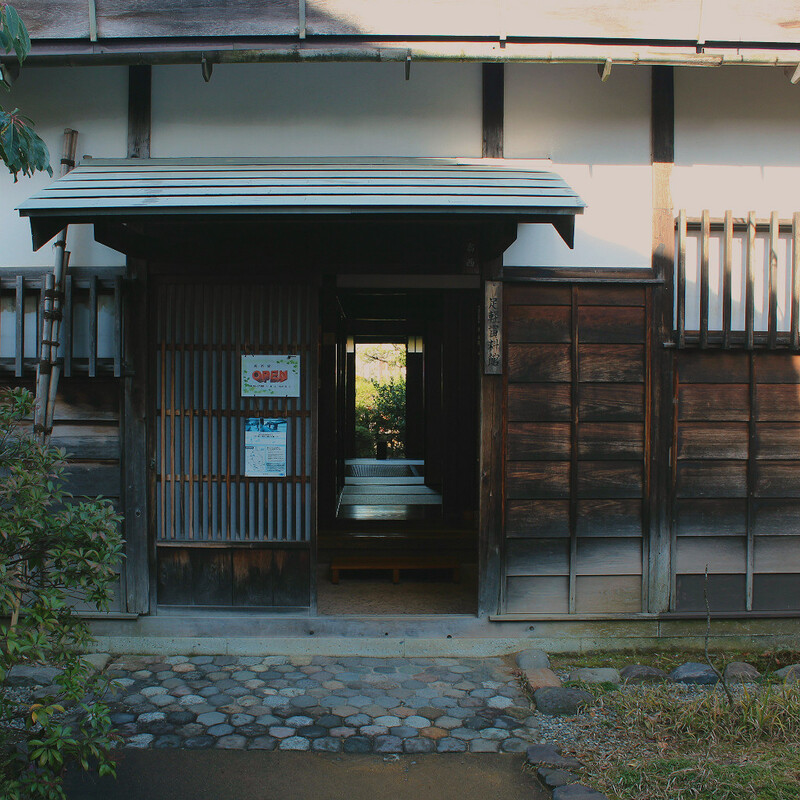 These two preserved houses belonged to lower-class samurai foot soldiers. Both buildings are free to enter. Each houses information and examples of how the soldiers lived and worked. One even includes a map of the pilgrimage the army took on foot each year to offer tribute to the ruling Shogunate. English from the staff is hit or miss, and many of the displays are in Japanese only. The museum provides a glance at their owners’ limited lifestyles in a bygone era. Ashigaru’s entrance is also easy to miss, hidden by bushes and a protective wall, by the bridge just past the nearby hospital. We recommend summer visitors come early in the morning, as the buildings do not supply air conditioning.